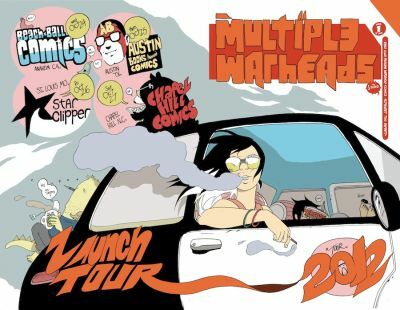 Taking his cue from the c haracters in his new mini-series, Brandon Graham (KING CITY, PROPHET) is embarking on a cross-country trip to promote MULTIPLE WARHEADS: ALPHABET TO INFINITY with signings at comic book stores from October 24 through 27. Coming together to promote the signing tour are retailers from California to North Carolina who wanted to show their support for Graham’s surreal science fiction comic about organ smugglers in a fanciful, futuristic Russia. All four stores on the tour will have an exclusive edition of the 48-page, full-color MULTIPLE WARHEADS #1 with a wraparound variant cover by Graham, for $3.99. A two-part interview with Graham about MULTIPLE WARHEADS also ran at Comics Alliance in August.